Moving picture experts group (MPEG) standards are digital video encoding processes that coordinate the transmission of multiple forms of media (multimedia). MPEG is a working committee that defines and develops industry standards for digital video systems. These standards specify the data compression and decompression processes and how they are delivered on digital broadcast systems. MPEG is part of International Standards Organization (ISO). The MPEG system defines the components (such as a media stream or channel) of a multimedia signal (such as a digital television channel) and how these channels are combined, transmitted, received, separated, synchronized and converted (rendered) back into a multimedia format. The basic components of a MPEG system include elementary streams (the raw audio, data or video media), program streams (a group of elementary streams that make up a program) and transport streams that carry multiple programs. This figure shows the basic operation of an MPEG system. 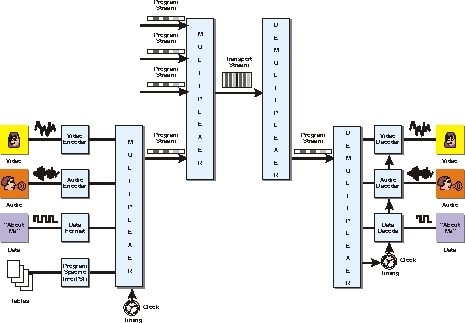 This diagram shows that the MPEG system allow multiple media types to be used (voice, audio and data), codes and compresses each media type, adds timing information and combines (multiplexes) the media channels into a MPEG program stream. This example shows that multiple program streams (e.g. television programs) can be combined into a transport channel. When the MPEG signal is received, the program channels are separated (demultiplexed), individual media channels are decoded and decompressed and they are converted back into their original media form. The MPEG system has dramatically evolved since 1991 when it was introduced primarily for use on compact disk (CD) stored media. The first version of MPEG, MPEG-1, was designed for slow speed stored media with moderate computer processing capabilities. The next evolution of MPEG was MPEG-2, which allowed television broadcasters (such as television broadcasters, cable television and satellite television providers) to convert their analog systems into more efficient and feature rich digital television systems. Since its introduction, the MPEG-2 system has evolved through the use of extensions to provide new capabilities. The term MPEG-2.5 is a term commonly used to describe an interim generation of MPEG technology that provides more services and features than MPEG-2 but less than the MPEG-4. The development of an MPEG-3 specification was skipped. MPEG-3 was supposed to be created to enhance MPEG-2 to offer high definition television (HDTV). Because HDTV capability was possible using the MPEG-2 system, MPEG-3 was not released. The next progression of MPEG technology was the release of the initial parts of the MPEG-4 specification. The MPEG-4 specification allows for television transmission over packet data networks such as broadband internet. The initial release of the MPEG-4 system did not offer much improvement over the MPEG-2 video compression system. To develop this more efficient video compression technology for MPEG-4, a joint video committee was created. This joint video committee was composed of members from the IETC and ITU for the purpose of analyzing, recommending, solving technical issues to create an advanced video compression specification. The result of this joint effort was the production of the advanced video coder (AVC) that provides standard definition (SD) quality at approximately 2 Mbps. This new part of MPEG-4 video compression (part 10) technology is approximately 50% more efficient (higher compression ratio) than MPEG-2 video coders. The version of AVC defined by the ITU is called H.264. 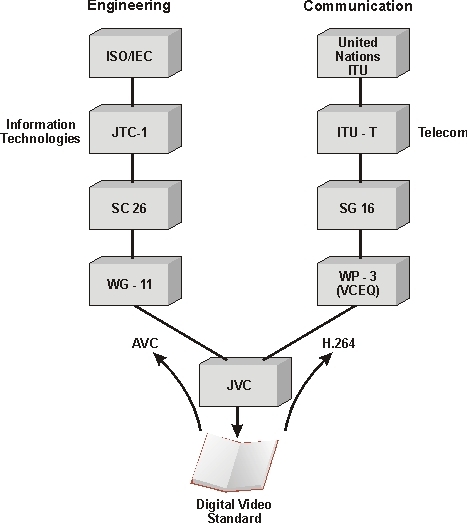 This figure shows how the video coding developed for MPEG-4 was a joint effort between the ISO/IEC and United Nations ITU. Both groups worked together to produce the video coding standard. The ISO/IEC version is called advanced video coding (AVC) and the ITU version is called H.264. There are other MPEG industry standards including MPEG-7, which is adds descriptions to multimedia objects and MPEG-21, which adds rights management capability to MPEG systems. This figure shows how MPEG systems have evolved over time. This diagram shows that the original MPEG specification (MPEG-1) developed in 1991 offered medium quality digital video and audio at up to 1.2 Mbps, primarily sent via CD ROMs. This standard evolved in 1995 to become MPEG-2, which was used for satellite and cable digital television along with DVD distribution. The MPEG specification then evolved into MPEG-4 in 1999 to permit multimedia distribution through the Internet. This example shows that work continues with MPEG-7 for object based multimedia and MPEG-21 for digital rights management.